May 1983: he makes his first appearance on stage at the Kabukiza, in the play "Genji Monogatari". May 1985: he receives the name of Ichikawa Shinnosuke VII at the Kabukiza, playing in the drama "Uirô Uri". January 2000: Shinnosuke plays for the first time the prestigious role of Sukeroku in the drama "Sukeroku Yukari no Edo Zakura", which is performed at the Shinbashi Enbujô. March 2001: Shinnosuke plays at the Shinbashi Enbujô the roles of Hayano Kanpei (only in the "Ochiudo" dance) and Sadakurô in the drama "Kanadehon Chûshingura", which is staged by the Onoe Kikugorô Gekidan to commemorate the 12th anniversary (13th memorial service) and the 6th anniversary (7th memorial service) of the deaths of late Onoe Shôroku II and Onoe Baikô VII. September 2002: last Kabuki performance for Shinnosuke before a long TV break. He plays the role of Sasahara Yogorô in the drama "Tsuruga no Matsu Chitose no Taihei" and a fireman boss in the dance "Omatsuri", which are staged at the Shinbashi Enbujô. Fall 2002 ~ Fall 2003: Shinnosuke is the leading star of the NHK TV series "Musashi", based on the life of the popular hero Miyamoto Musashi (1584~1645), who searched for enlightenment by the Way of the (wooden) sword. November 2003: Shinnosuke is back in the Kabuki world, playing the role of ... Miyamoto Musashi in the eponymous Kabuki drama, which is staged at the Shinbashi Enbujô. December 2003: Shinnosuke plays for the first time the prestigious role of the warrior Saitô Bettô Sanemori in the "Sanemori Monogatari" scene of the epic drama "Genpei Nunobiki no Taki", which is staged at the Kabukiza. May 2004: Ichikawa Shinnosuke VII takes the name of Ichikawa Ebizô XI at the Kabukiza, playing the roles of Kamakura Gongorô Kagemasa, Kisuke, Togashi and Isobe Kazuenosuke in the dramas "Shibaraku", "Ise Ondo Koi no Netaba", "Kanjinchô" and "Sakanaya Sôgorô". His father Ichikawa Danjûrô XII, who shares the stage with him in the drama "Ise Ondo Koi no Netaba" and the dance-drama "Kanjinchô", suddenly falls ill and has to be replaced. June 2004: Ichikawa Ebizô XI celebrates his second month of shûmei at the Kabukiza, playing the roles of the spirit of the Lion in the dance "Kagami Jishi" and Sukeroku in the drama "Sukeroku Yukari no Edo Zakura". His stage partner in the role of Sukeroku's lover Agemaki is Bandô Tamasaburô. His father Ichikawa Danjûrô is unfortunately on sick leave. July 2004: Ichikawa Ebizô XI celebrates his shûmei in Ôsaka at the Shôchikuza, playing the roles of Yosaburô and the warrior monk Musashibô Benkei in the drama "Yowa Nasake Ukina no Yokogushi" and the dance "Kanjinchô". 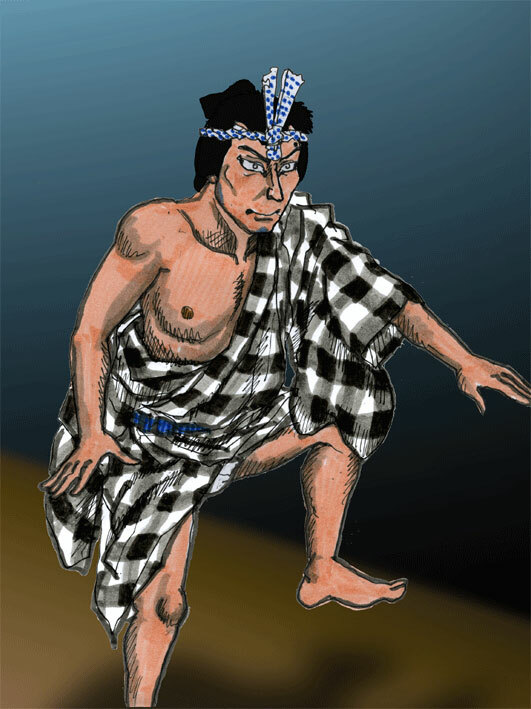 His stage partner in the former play in the role of Yosaburô's lover Otomi is Onoe Kikunosuke. His stage partners in the latter play in the roles of Togashi and Yoshitsune are Kataoka Nizaemon and Nakamura Ganjirô. His father Ichikawa Danjûrô is unfortunately on sick leave. September 2004: Ichikawa Ebizô XI celebrates his shûmei in Nagoya at the Misonoza, playing the roles of Hikaru-no-Kimi and Sukeroku in the dramas "Genji Monogatari" and "Sukeroku Yukari no Edo Zakura". His father Ichikawa Danjûrô is unfortunately on sick leave. October 2004: tour in Paris (France); Ebizô celebrates his shûmei in Paris at the Théâtre de Chaillot, playing the roles of Kikuchi Hankurô and the lady-in-waiting Yayoi (possessed by the spirit of a Lion) in the drama "Toribeyama Shinjû" and the dance "Kagami Jishi". This unusual event celebrates also the recovery of his father Ichikawa Danjûrô, who is back on stage in the role of Sakata Ichinosuke in the drama "Toribeyama Shinjû" [more details]. December 2004: Ichikawa Ebizô XI celebrates his shûmei in Kyôto at the Minamiza, playing the roles of Kamakura Gongorô Kagemasa and Sukeroku in the dramas "Shibaraku" and "Sukeroku Yukari no Edo Zakura". June 2005: Ichikawa Ebizô XI celebrates his shûmei in Fukuoka at the Hakataza, playing the roles of Hikaru-no-Kimi and Sukeroku in the dramas "Genji Monogatari" and "Sukeroku Yukari no Edo Zakura". July 2005: Ichikawa Ebizô XI celebrates his shûmei in the Eastern Provinces, playing the role of the warrior Saitô Bettô Sanemori in the drama "Sanemori Monogatari". September 2005: Ichikawa Ebizô XI celebrates his shûmei in the Western Provinces, playing the role of the warrior Saitô Bettô Sanemori in the drama "Sanemori Monogatari" and the leading role of the dance "Omatsuri"; he has to replace in the latter role his father, who unfortunately falls ill again. May ~ June 2006: Kabuki tour in Western Europe, in London at the Sadler's Wells (31 May~11 June) and in Amsterdam at the Stadsschouwburg (15~18 June); Ebizô plays the roles of the spirit of the wisteria and Yoemon in "Fuji Musume" and "Kasane" [more details]. March 2007: tour in Paris (France); Ebizô plays at the Palais Garnier the roles of Musashibô Benkei/Togashi (in alternance with his father) and Princess Sarashina (in reality the ogress of Mount Togakushi) in the dance-dramas "Kanjinchô" and "Momijigari", which celebrate the Ichikawa clan [more details]. January 2008: revival at the Shinbashi Enbujô of "Narukami Fudô Kitayama Zakura", which celebrates the 1070th anniversary of the Narita-san Temple, where the Deity Fudô Myôô is worshipped; Ebizô plays the roles of the wicked priest Narukami, Kumedera Danjô, the deity Fudô Myôô, Abe no Kiyoyuki and Hayakumo no Ôji [casting]. September 2009: short Kabuki tour in Monaco for the Naritaya guild; Ebizô plays the role of the lady-in-waiting Yayoi (possessed by the spirit of a Lion) in the dance-drama "Kagami Jishi" [more details]. June 2010: Kabuki tour in Western Europe, in London at the Sadler's Wells (4~15 June) and in Roma at the Teatro di Roma-Argentina (21~22 June); Ebizô plays the roles of Satô Tadanobu and the fox Genkurô [more details]. August 2013: 1st edition of the ABKAI - Ebikai, the gala of Ebizô [more details]. January 2014: premiere at the Shinbashi Enbujô with Ebizô as zagashira of the drama "Kotohoide Mimasu Kagekiyo", a newly-created drama mixing 4 dramas belonging to the Kabuki Jûhachiban and focusing on the warrior Akushichibyôe Kagekiyo [more details]. May 2015: revival at the Kabukiza of the drama "Jayanagi"; Ebizô plays the roles of Tanba no Suketarô (in reality the spirit of the Snake Willow) and the warrior Kongômaru [more details]. Ichikawa Ebizô XI is a young and extremely popular tachiyaku actor. He will take the prestigious name of Ichikawa Danjûrô XIII in May 2020.